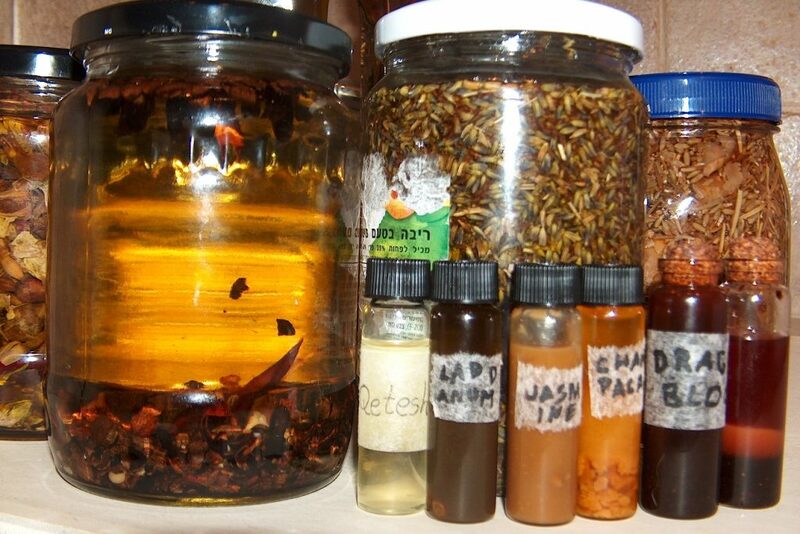 Oil recipes abound, but very little is written about the process of making magickal oils. An oil evaporates more slowly than something water or alcohol based. It stays liquid and active longer once exposed to air. Oils also have a long shelf life without the need for absolutely sterile conditions. They lubricate. They can be emollients to hold moisture in. They can form a protective layer to keep things out. All around, oils are a good tool, and their making should be taken quite seriously. There are two main ways that magical oils are made: by infusion, and by mixing essential oils, attars (oils extracted by an Arab method of water distillation), and absolutes. Some magical oils are combinations of these. Since essential oils and the newer attars were not available in ancient times, most of the oldest recipes use infusion. Dried ingredients are put into a container, and mixed with a neutral or compatible smelling carrier oil. This is left to steep for a time, during which we say the oil is “pregnant”. It is “birthed” when this required pregnancy stage is over. A proper carrier oil for magical use should be as close to natural as possible or available. It should be cold pressed or very gently extracted. It should also be sacred to, or at least compatible with the related deities, spirits, or energy of its designated purpose. For example, if it is for Eshu, almost any will work, but coconut oil, peanut oil (if one is not allergic), or palm oil would be best. If for Oshun, sunflower or almond oil would be best, and so on. Herbs and other materials used for infusion oils should be dried thoroughly. If not, they will spoil. Different herbs react differently to oil. Some release a lot of their scent, where others are a bit more difficult, and can take longer, or may not release any of their scent at all. So if you really want them blended into the oil, you need to powder them finely enough to make a suspension where little bits of the herb are distributed in the oil. Essential oils can often be mixed and ready to use immediately, but when they are for magick, some still need a pregnancy anyway, so they have time to take on the appropriate energy. 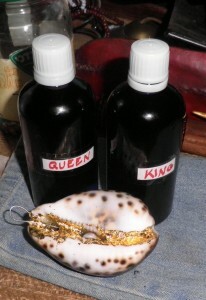 For Orisha and related condition oils, the obvious first step is Eshu. Different people have different levels of thoroughness about this, depending on their traditions, their head, and the purpose of the oil. Some consecrate and dedicate their tools to Ogun. Some feel that by virtue of tools being tools they are already sacred enough to Ogun. Children of Oya are sometimes more pedantic about this with age because we understand that if we let things get too far out of hand, chaos may ensue. So making sure everything is “tight” is our way of preventing or mitigating chaos. Every oil should have an ingredient that is the Eshu (or whatever your Gatekeeper is called) in it. This opens the magick in it, and makes sure it will do what it should. If it isn’t an individual ingredient, it should be 3 drops of Eshu oil. Many people make oils every day that don’t include this first step, or without at least passing the finished oil through Eshu incense smoke, and their oils still work somewhat. Eshu is merciful in that he will often allow something to pass despite a lack of knowledge. Now that you’ve read this article though, you know why some things did not work as dependably as they could. This does not mean you should throw away all your oils. It just means that now that you know, you should give Eshu some nice offerings to apologize for forgetting him and thank him for allowing things to work as well as they have thusfar. Pass all of your oils through Eshu incense, and don’t forget him in the future. While you’re at it, if you are more witch and less priestess, you may want to make some time for Oko as well. The pregnancy phase of an oil is part of its enchantment. Often, you will need to wrap the oil in fabric with a pattern sacred to a deity, or keep it in a certain place. Protection oils need the ashe (energy, active power) of being protected. Love oils need the energy of love and being admired, etc. Also helpful in the enchantment of an oil is its container. If the oil is for love, it is nice to put it in a container that is pretty, and add some ingredients that may just be to make it more beautiful. You can use various objects, dyes, cosmetic grade glitters and pigments. Be creative, but try not to go overboard. (I can imagine all the Oshun-heads reading this going, “Yeeeee!! !”) Just make sure all additional ingredients are compatible. An example of a good addition would be putting alkanet (a red dye) in Red Fast Luck oil. A bad addition would be to add charcoal to it to make it scarier and tar looking. Not opening with Eshu, we’ve already covered. This is when you use the same dropper or spoon for different ingredients without cleaning them. When you do this, you end up mixing things and ruining the scent and energy of your oils. You may have to use the same oil for various purposes, so use a different pipette, dropper, or spoon for different things. You can get 500 pipettes for cheap and reuse them multiple times if you wash them in warm water with grease cutting detergent. If they split, tape them up with electrical tape, and they’re good as new. I add these pieces of vanilla pod to embody the energy of Eshu in this protection oil. May Eshu open the way for it to work effectively, and protect the wearers from any harm. 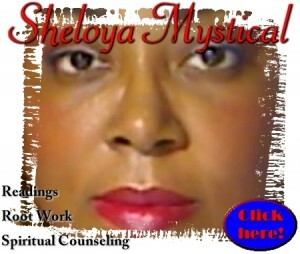 I add this sea shell to embody the energy of Yemaya, mother of all living beings on Earth. May she stand between the wearer and those with harmful intentions, like a mother protecting her child from bullies. You don’t just dump things in a jar and only think of their mystical purpose after the fact. Attentiveness is something that is woefully missing from modern magical practice, and needs to be brought back. In some cases, it is more important than the ingredients. When you can’t find dragon’s blood, you’d better have some inner astringent fire energy to give it. When you make an oil, you’re basically weaving a spell in a jar. Whether it is for yourself or to sell or gift to others, it should be made with mindfulness and precision. So next time you read an oil recipe and want to use it, remember that it’s not just about the recipe. It’s about the energy. how to make magical oil, how to make magickal oil, magical oil, magickal oil, making magickal oil, oil, oil magic, oil magick, oils. Bookmark. excellent – mindfulness on the added ingredients’ purpose and particularly liked the phrase “you’re basically weaving a spell in a jar”. Thank you ! Thank you for the feedback 🙂 I’m glad you liked the article. How long does the ‘pregnancy’ phase of oils last? Is there a minimum for effectiveness before they should be used? Thank you for this great article.